I don’t know about you, but I never grow weary of good ol’ chocolate chip cookies. There aren’t many things much better than a freshly baked, warm, chocolate chip cookie. I’ve made my fair share of them over the years, and I’m sure there will be many more variations to come. 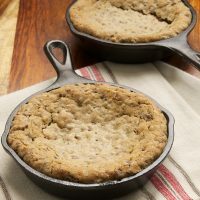 This particular chocolate chip cookie is a bit different in that it passes up the dough-scooping step and simply utilizes a cast-iron skillet to make a big, soft, gooey cookie. Without all the scooping, you’ll have this cookie mixed and in the oven in short order. While you can certainly bake this cookie dough in a large skillet, I opted to use my mini 5-inch Lodge skillets to make smaller cookies. I can’t help it. 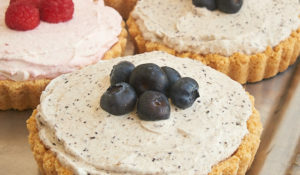 I’m a sucker for mini desserts! Each of these will serve two, so divvy it up before serving, or grab a friend and a couple of forks and just dig in. I’ll reiterate the soft and gooey comment from a few lines back. This cookie is designed to be eaten with a fork or spoon. It’s a little softer than a traditional chocolate chip cookie. 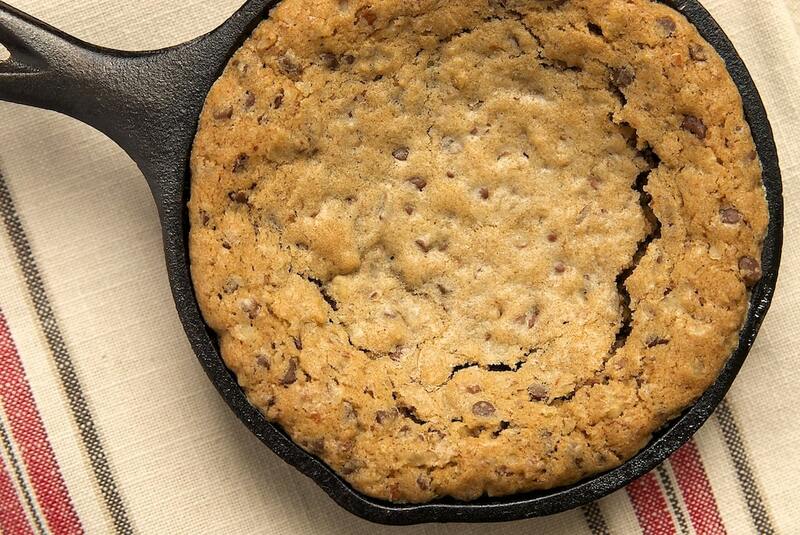 As the dough bakes in the skillet, the cookie may even collapse a bit onto itself. If you opt to make these in mini skillets, that little dip in the middle is just crying out for a scoop of ice cream. So, of course, that’s just what I did. I went for a simple dollop of vanilla bean ice cream to top off these cookies. If you want to go all out, add some caramel sauce and maybe some extra chocolate chips or nuts. It will be like a little ice cream sundae on top of a warm cookie. Oh, my. Mini Skillet Chocolate Chip Cookies are great for sharing or for when you have a big cookie craving! 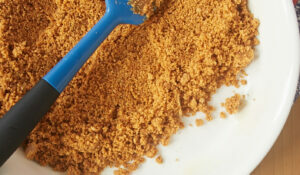 Combine the butter, sugar, and brown sugar with a spoon or an electric mixer on medium speed. Mix until light and fluffy. Mix in the egg and vanilla. Stir in the flour, baking soda, and salt. Stir in the chocolate chips and nuts. Transfer the dough to four 5-inch cast-iron skillets** or one 10-inch cast-iron skillet. Spread evenly and smooth the top. Bake 18-20 minutes, or until golden brown and just set in the center. Cool 5 minutes before serving. *I recommend mini chocolate chips if you’re using the mini skillets. **The simplest way to divide the dough evenly is to press it down lightly to fill your mixing bowl evenly. Then, use a spoon or spatula to divide it into quarters. No scale necessary! Didn’t I see those cute little lodge pans on your instagram feed? 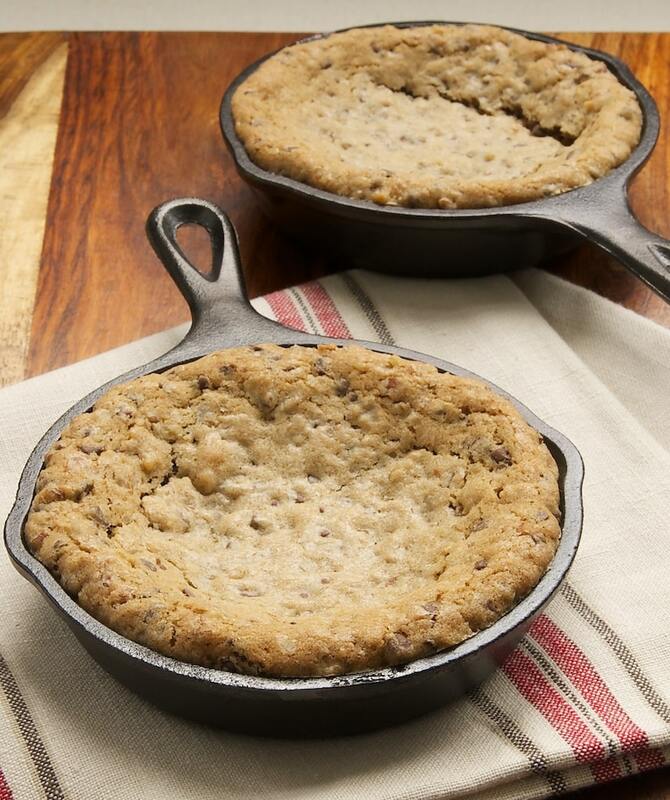 A skillet baked cookie is the perfect way to use those little guys! I can only imagine how freaking good they would be with ice cream and caramel sauce. LOVE those cute little skillets! Everything is better when it is miniature. 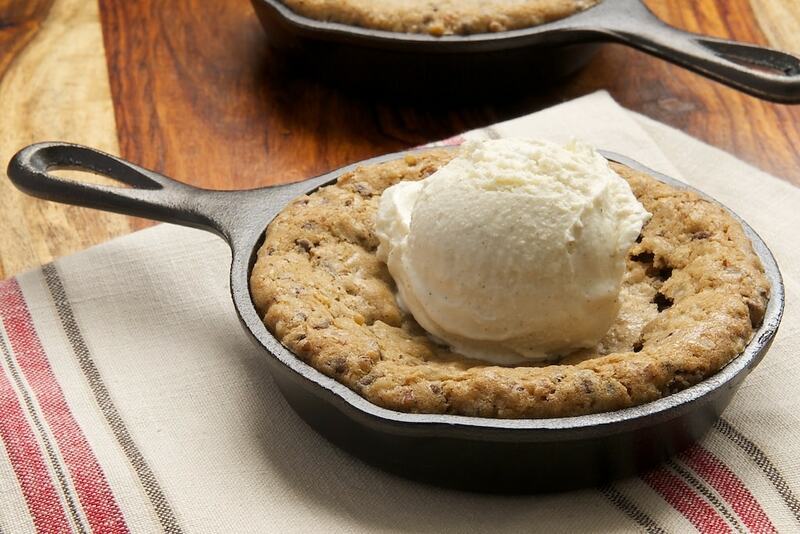 I would love a skillet cookie for dessert right now! I love personal chocolate chip cookies! This looks like a fabulous dessert for two! Most of the time the best desserts are the simplest ones. Chocolate chip cookies never fail! 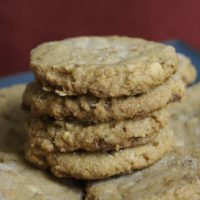 You could even do this with oatmeal raisin cookies and serve it for breakfast! You just gave new meaning to my mini skillet. Over the weekend a along with a couple of friends celebrated another friend’s birthday at a local restaurant. The “free” birthday dessert was a warm choc chip cookie baked in a 6″ cheesecake pan, topped with vanilla ice cream & then whipped cream. Sharing is part of the fun of a dessert like this. These look so good – can’t wait to try them. Thanks for sharing! I just want to shove my whole face in that skillet. Seems appropriate, right? Nothing better than a soft gooey chocolate chip cookie! I’m the same as you – could never get sick of them! However this presentation does spice them up a bit =) so cute! You had me at soft. And then again at gooey. 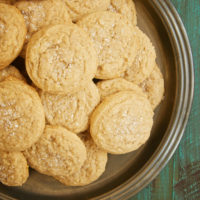 Using these cute little skillet amp up the flavor and texture on these cookies for sure! Super cute cookies and skillets! I want! And need! 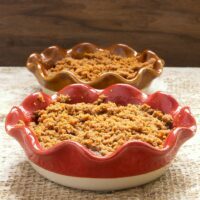 These would be so fun to serve for dessert at a dinner party- you could have the dough all ready to go and serve them warm. Love the adorable skillets! I agree with Joanne, I’d like to stick my whole face in it too! 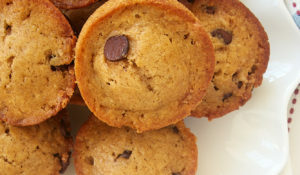 I love, love choco chip cookies, and these look delicious! and I love how these are sorta like individual serving sizes! Hoorah! 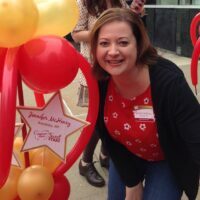 Hi, Jennifer! I’ve been thinking about making these, but I have neither mini skillets nor a 10-inch skillet. 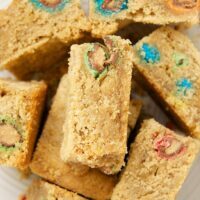 Could I make these in a 10-inch silicone pan? Hi, Kendall. I have very little experience with silicone pans, but I think this should work fine. D’Agostino’s near Wrigley Field in Chicago does this type of huge chocolate chip cookie (warm of course) with ice cream and hot fudge sauce. I can’t even begin to tell you how good it is – a kind if Super Comfort food! I’ve been wanting to make this! 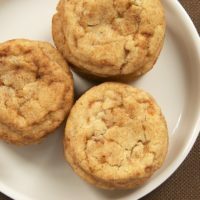 I cannot find any 5″ in our local store, they only have 3.5″ and 6.5.” Which of the two can be used to substitute for the 5″ skillet for this recipe, making it still soft and gooey? Hi, Mia. You just have to adjust for volume. For 6.5″ skillets, you’ll need 2. They will be a bit more full than the ones I made. For 3.5″ skillets, you’ll need 8 to 9. It works out to about 8 & 1/2. When you transfer the dough to the skillets, just be sure to leave some room at the top to allow them to rise. Would you adjust the baking time on the 3.5 size pans? 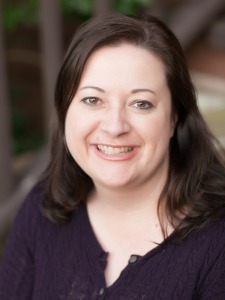 Hi, Cindy. The baking time shouldn’t vary much, if at all. Maybe just a couple of minutes less. I Love all recpe. I think they are so interesting. Thank you. Are you cleaning your iron pans with soap and water? If you clean mostly by scrubbing with salt, or occasionally with just hot water, then heat to dry thoroughly and then wipe with some sort of fat (coconut oil, bacon fat, palm oil, etc.) then you won’t have rust or a metal smell.